The Siamese Hotel is situated on Pattaya 3rd Road, upon 7 floors you have the scenery of landscape of Pattaya. Only 90 minutes from Suwannabhumi Airport. 1. Start from Bangkok-Chonburi-Pattaya Mortorway (Highway No. 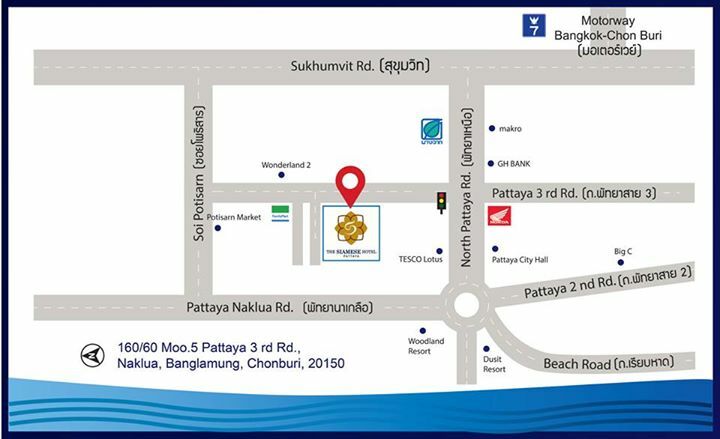 7), turn right to Pattaya and Sukhumvit intersection, turn left to North Pattaya Road, go along the way approximately for 1 km to Chalerm Phrakiat (Pattaya Sai 3) and North Pattaya Road intersection, turn right and go straight on for 200 m, the Siamese Hotel is your left. 2. Bus from Bangkok-Pattaya available at Mochit and Eakamai Bus Station, Bangkok. © 2015 The Siamese Hotel.